The PDCA cycle is the most used methodology to implement a continuous improvement system in a company or organization. In this article, we are going to explain to you what it represents, how it works and what is the relationship with the PDCA Cycle and some ISO standards, as ISO 9001 for Quality Management Systems, in which is mentioned as a fundamental principle for the quality continuous improvement. What is the PDCA Cycle ? 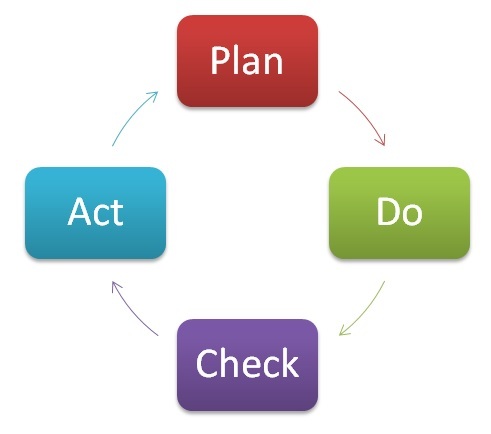 The name of PDCA comes from the acronym “Plan , Do, Check, Act” (PHVA in Spanish) , and is also known as the cycle of continuous improvement or Deming Cycle (because the name of its author, Edwards Deming). 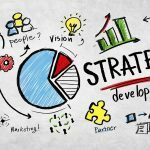 This methodology describes the four essential steps that should be carried out systematically to achieve continuous improvement , defined as a continuous way to improve the quality of our products and processes (decrease failures, increase effectiveness and efficiency, problem solving, avoid potential risks … ) . The Deming Cycle is composed for four cyclic steps , so that once finished the final stage we have to start again with the first one, and repeat the cycle again. Doing that in a company, the activities are reevaluated periodically to incorporate new enhancements . The application of this methodology is primarily intended to be used for companies and organizations, but you can also use it in any other situation. How to implement the PDCA cycle in a company? 1. Plan: Locate what can be improved, fix an objective and think about how this objective can be archived. You can create working groups to search potential improvements in the processes and products of your company. It can help to listen to the ideas of the employees, and find better and new technologies that the company has not used yet. 2. Do: We made the required changes to implement the proposed improvement in our processes. In general, it is recommended to do a pilot project to test the operation before making large-scale changes. 3. Check: Once the changes are implemented, we establish a trial period to verify the developing of the new process. If the improvement does not achieve the initial expectations we will have to modify the process again to obtain the desired objectives. 4. Act: Finally , when the trial period ends, we have to study the results and compare the performance of our processes and activities before and after the improvement. If the results are satisfactory the improvements will be implemented permanently. However, if they are not satisfactory we will have to decide whether to make more changes to adjust the results or to discard them and return to the start point. Once completed the step 4, you have to return to the first step periodically to implement more new improvements. Let’s take a simple example: A factory that produces aluminum pieces. 1 ) Potential improvements are searched and analyzed, either because there have been detected problems, because the workers have proposed a different way to perform some task, because the market offers more efficient machines that would save costs, etc. .
2) The potential improvements and its impact are studied. 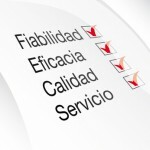 We choose the improvements that can work better and we decided to implement them in a small-scale pilot test. 3) Once finished the on the pilot test, it is verified that the changes work correctly and that they archive the desired result. 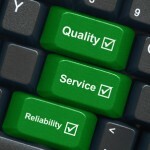 If the changes do not meet expectations, they have to be modified to work as expected. 4) Finally, if the results are satisfactory, the improvements will be implanted on a large scale in the production line of the factory. Once completed and implanted the improvements, the activities in the factory aluminum pieces will work more efficiently. However, in the future we should reapply the Deming Cycle periodically. Several ISO standards talk about the concept of Continuous Improvement. For example ISO 9001 talks about the continuous improvement in the quality management system, explicitly naming the PDCA Cycle (Plan, Do, Check and Act). According to ISO 9001:2008, all Quality Management Systems certified with this standard must apply the methodology of continuous improvement in a systematic way. Another widespread standard that refers to continuous improvement is ISO 14001 “environmental management systems”. It also refers to the PDCA cycle again as the basis for the implementation of an environmental management system. Read here the original post: Ciclo PDCA. 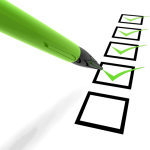 Checklists: What is a checklist and how to use it? Copyright © 2019 PDCA Home (en) - All about management, quality, production and continuous improvement.